This guidance helps your team create a baseline understanding of their patients’ experiences. This sets the tone and understanding to inform all other modules. 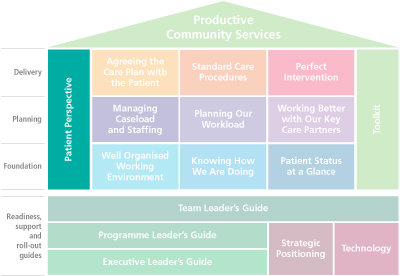 Visit our catalogue to download the 'Patient Perspective' module by clicking on the Productive Community Services house, below. These are links to some of the current national policies and guidance for Patient and Public Engagement. Care Quality Commission CQC (Health Care Commission): Listening, learning, working together? Useful websites and reports that describe methodologies and include associated costs. www.peopleandparticipation.net has a comprehensive list of methodologies.